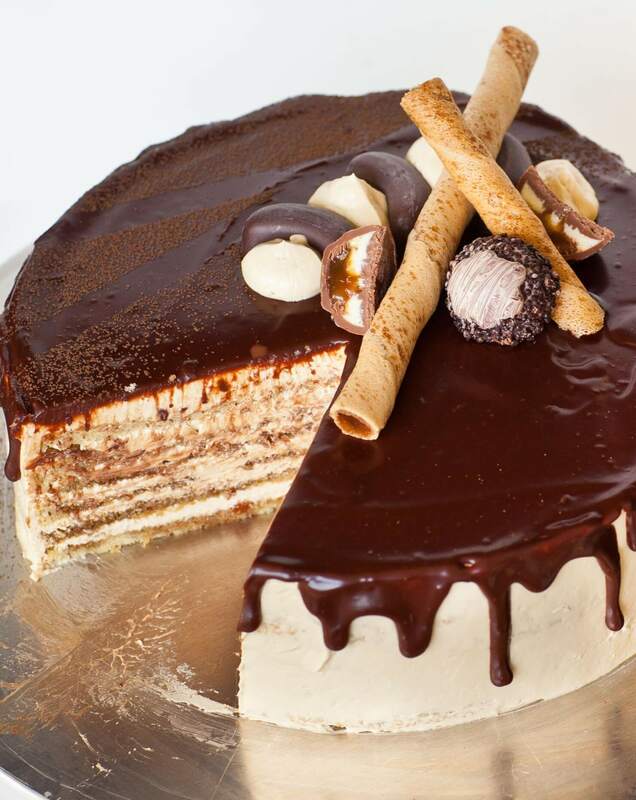 The iconic, classic Opera Cake! If you’ve never tried this famous cake creation, you’re in for a real treat! When you take a bite of this cake, your taste buds will be in cake heaven! This 6-layer coffee cake is made with almond sponge cake, soaked with coffee syrup and frosted with coffee buttercream! Dessert just doesn’t get any better than this! The original French recipe requires many intricate steps, but I’ve simplified this recipe so you can easily make and enjoy this dessert at home. For the cake layers, I used my basic sponge cake recipe and added almond flour for a bit of nutty flavor. I highly recommend adding the almond flour for taste. If you don’t have it, more all-purpose flour will work in a pinch. The layers are then soaked with a Kahlua liqueur and coffee syrup, ensuring that you’ll get coffee flavor in every bite! The layers are frosted with a coffee-flavored buttercream, then topped with a simple chocolate ganache. I like to let the cake stand in the refrigerator overnight to allow the flavors to really come together. Just take the cake out about an hour or two before enjoying to allow the cake to thaw. The Opera Cake was created in France in 1955 by French pastry chef Cyriaque Gavillon and named after the Parisian ‘Palais Garnier’ opera house. Cyriaque wanted to create that captured the elegance and style of the city. It’s traditionally made in a rectangle shape and you can find it in just about any Parisian bakery shop! Preheat oven to 350F. Line and spray 3, 8-inch cake pans with parchment paper; set aside. Prepare the sponge cake layers: place the eggs and sugar into mixer bowl and whisk on high speed for 5 to 7 minutes until light, fluffy and almost white in color. Add the vanilla and whisk to incorporate. In a separate bowl, combine the dry ingredients: flour, almond flour, baking powder and salt. Using a fine mesh sifter, add the flour into the eggs in small batches. Fold the flour in gently but thoroughly. Divide the cake batter evenly between the 3 pans; I recommend using a kitchen scale for accuracy. Use an offset spatula to spread the batter evenly to the edges of pan. Bake in preheated oven for 13 to 15 minutes, just until top starts turning a golden color. Remove cakes from pans and set onto cooling racks to cool. Cake layers are very fragile, handle with care! While cake layers are cooling, prepare the syrup and buttercream. For the syrup, dissolve the 2 tablespoons coffee in 1 tablespoon water, then add the simple syrup and coffee liqueur. If you prefer a cake with no alcohol, simply substitute with more simply syrup. For the buttercream: whisk the softened butter on high speed for about 5 minutes, scraping sides of bowl often, until butter is light and fluffy. Add the sweetened condensed milk in small amounts until well incorporated. In a small bowl, dissolve the 1 tablespoon coffee in 1 tablespoon COLD water and add the coffee to the buttercream. Continue whisking for a few more minutes. To assemble the cake: use a long serrated knife and split each cake layer in two, to have a total of 6 layers. Soak each layer generously with prepared syrup, then frost with buttercream. Repeat for all layers. Frost the top and sides of cake with remaining buttercream. Even off the tops and sides with a flat spatula, then set cake into refrigerator to set for 15 minutes. Meanwhile, prepare the ganache: heat the 1/4 cup heavy cream in the microwave until very hot. Add the chocolate chips and stir until smooth. Transfer the ganache into a ziplock bag and let cool for a few minutes. Snip off the end of the bag with scissors, then drizzle the ganache down the sides of the cake first. Spread the remaining ganache over the top and use a flat spatula to spread it evenly. Garnish the cake as desired. Place cake into refrigerator to set for at least a few hours, or overnight. Remove the cake from the refrigerator about 30 to 45 minutes before serving to allow the buttercream to soften. Hmm, did you whisk your eggs very well? That’s the biggest issue with sponge cakes. The eggs have to be very light and fluffy, otherwise the cake will fall flat. I tried this recipe twice. Both times it fell flat. The second time I did whisk for 7 minutes. I timed it. This cake is amazing!! We did find it a bit too sweet for our liking, What can I do to the soaking mixture to make it not so sweet? Should I just dilute it with more water? And what about making my own “simple syrup”? Would that work? Any suggestions would be greatly appreciated!! Hi there can you use almond meal instead of flour ? Очень вкусный торт! Я спёк этот торт, всё получилось так как должно. Правда я зделал две порции для выпечки так как хотелось чтобы торт получился выше. Я кофе люблю и с этим кофейным тортом было просто ям!!!! I’ve had my eye on this cake for some time now! Looking forward to making it for easter! Hi tanya what kind of chocolates did u put on top for decorations? Hi Tatyana, can I use caramel syrup instead of vanilla? This recipe is the absolute best!! Made it dozens of times for various occasions and each time it’s major hit! Hi T, I have made this cake twice and I absolutely love it but the only problem I face is that my cake is that it caves in. So glad you enjoy it! Hmm, is the cake falling flat while it’s in the oven? Try whisking your eggs a bit longer. That should help! Hi T, this cake looks delicious! May I know if I can use 2 of 9 inch pans to make 4 layers instead of 3 of 8 inch pans for 6 layers? Oh.. Thanks so much… I will make this as a birthday cake.. It looks just delicious! Hi T, yeah, i tried to use 2 9 inch pans to make the cake with the same recipe.. But then my cake didnt rise enough to cut into 2 layers. May i know something went wrong? This recipe is the absolutely the BEST!!!! Made it a few times for various occasions and each time it’s major hit! Today I was asked to make it for the family reunion. Hi, this cake interested me because its made of almond flour instead of wheat-based flour. Because I am likely making it for a gluten-free person, are there any replacements for the 1/4 cup of allpurpose flour? Would I be able to bake this in a 6-inch pan? Or would that be too risky? Tanya how do you make your simple syrup? Could I use Swiss Meringue Buttercream Icing instead? Thank you so much for sharing and I’m so glad you enjoyed it! 🙂 This is one of my personal favorites! I made just the almond sponge cake to see if making this sponge cake would good enough to have for my birthday. Good news is it is pretty darn good! However, after folding the batter when I place it on a pan, I saw that not all the flour mixture got mixed in so I had to quickly mix that in. Another is I can see from the video that you got a nice tan/fawn color while mine was yellow. Could it be the eggs I used? I get my eggs from my own chickens that are only used for laying eggs.I’m responding to this because I was wondering what I did wrong and does anyone have tips that I should try next time. Thank you for your time and keep up the awesome work!!! Hi! I’m glad you enjoyed the recipe! Just make sure to scrap from the bottom of the mixing bowl next time to make sure all the flour gets incorporated. And yes, fresh eggs from home chickens are almost always much more intense in color so it wasn’t something you did wrong! You can try whisking the eggs for longer to get the batter more pale. Ok, I’ll do that next time. Thank you very much!!! Hi, i love this cake. feel to do it at home. i don’t have a mixer bowl, what can i use instead of that. can you tell the measurements for 1 cake tray..
You can use a hand-held mixer but it will take a bit longer to get the eggs to the right consistency. That buttercream looks absolutely divine! Can it be flavored with cocoa powder, Nutella or chocolate instead of coffee? I think it would be really good on your Ferraro Rocher cake I’m planning to make in a couple of weeks. Yes, that would taste amazing! 🙂 love that idea! I love your receipes. They always are a big hit with my family. I reside in a country where liqueur is not available. So Kahlua is out of question. Hence how do i make that syrup combination without that liqueur? Do I add equal amount of coffee and simple syrup or just substitute simple syrup for kahlua? Or is there any other option? can i make this into chocolate almond cake? if yes how much cocoa powder i must use ?